COMBINING PRECISION AND FUN TO CREATE A JAM PACKED LIVE MUSIC EXPERIENCE PERFECT FOR ANY COMMUNITY OR CORPORATE EVENT! What do you get when you mix the intensity of highly percussive drumming and blaring brass instruments with hip-hop and pop music of yesterday and today? 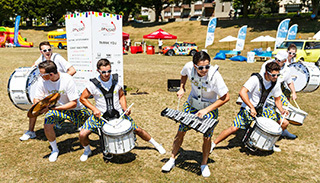 X Corps Drumline, a high energy performance group that's sure to be the highlight of any event they're a part of! Noteable Entertainment & Events is a Vancouver based booking agency, party rental, entertainment services and event production company. If you are interested in booking X Corps Drumline please contact us.